Most brands of vinyl siding are designed and manufactured to last for decades when installed correctly. For your siding to perform as designed, you should install your house siding exactly as instructed by the siding manufacturer. Your siding must be installed on top of structurally sound exterior sheathing or backer-board. You may have to remove your home's old siding, so that the new vinyl panels can be installed on top of a flat surface, such as your home's exterior sheathing. On some homes, you may be able to leave the old siding in place, covering it with a layer of rigid insulation on which to hang the new siding. Install a continuous water resistive barrier underneath the siding to ensure that water which penetrates siding does not cause damage to your home. When installed correctly, manufactured-approved house wraps and other flashing materials can shed rain water that finds its way underneath the vinyl siding panels. All vinyl siding expands and contracts due to the fluctuation of outside temperatures. This means you must install house siding in a way that accommodates for the panel's movement. To do this, leave approximately 1/4-inch of clearance at all openings and stops. Do not caulk the overlapping seams where two siding panels meet. 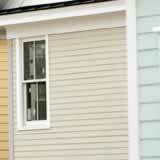 If you are unsure about how to install vinyl siding, consult a local siding contractor or the siding manufacturer. Installing siding correctly the first time is the best way to ensure that your home's siding will last a long time.